Our company is one of the leading suppliers and manufacturers of a wide range of Unijunction Transistors. Our product range also comprises of DC Electronics Systems, AC Electronics and Semi-Conductor Devices. With the active support of our team of experts, we are engaged in offering a huge gamut of Unijunction Transistors. 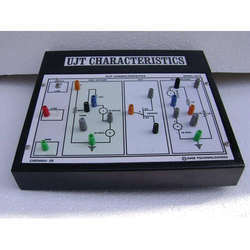 The best quality range of UJT Characteristics Apparatus is offered with Regulated Power Supplies. The main objective of this apparatus is to plot V-I Characteristics & to measure intercase resistance. Looking for Unijunction Transistors ?